When light rays travelling from air meet the upper surface of an oil layer, some light waves are reflected. Reflection of some light rays also occur at the lower surface of the oil layer. These two reflected rays interfer either constructively or destructively, depending on their phase difference. It should be noted that rays travelling from one medium into a more optically dense medium will have the reflected rays inverted hence destructive interference will occur. 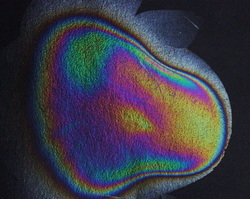 When these reflections occur from a layer of oil, for example, colourful pattern are produced. What is interference? How is constructive interference and destructive interference caused? their report sheets. Rubric is given by the teacher. EXIT QUESTION: Use diagrams to explain why the top of a soap film appears bright from one side and dark from the other side when light is transmitted through it. Colourful pattern on a thin film. White light interference on layer of lacquer.